Starring: Pilou Asbæk, Søren Malling, Gary Skjoldmose Porter, Abdihakin Asgar. A captain goes down with his ship. 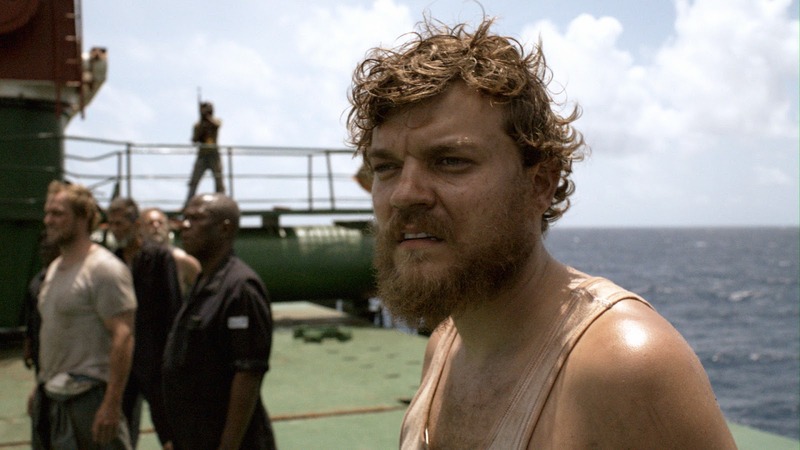 Tobias Lindholm crafts a compelling character study about a highjacking on the high seas, but the captain to sink in this psychological drama isn’t even aboard the ship. He’s a CEO named Peter, played by Søren Malling, all trimmed and dry in his Copenhagen office while the men of one of his boats, the MV Rozen, sweat it out on the ocean. A squad of Somali pirates captures the Rozen as it sails off the coast of Mombasa during the final stretch of a trip. Mikkel (Pilou Asbaek), the cook, has just called his wife to say he’ll only be a few more days. Cut to Copenhagen where Peter and the other suits of the company learn of the news. Lindholm, co-writer of the current release The Hunt, constructs A Hijacking with a disorienting speed. A Hijacking doesn’t present the act of the hijacking itself, just what happens before and after, and instead lets the negotiation of freeing the men of the Rozen offer the central drama. This isn’t an action film but a realistic and finely-tuned character study. The quick exposition of A Hijacking at first makes it difficult to tell whether Lindholm wants the audience to align with Mikkel or Peter. Presumably, the man on the boat, who is forced to do the negotiating for the pirates along with a translator named Omar (Abdihakin Asgar), is going to be the hero and the voice of reason in A Hijacking; however, Lindholm’s gritty approach almost defies sympathy for, and attachment to, the characters in this tense situation. The film cuts back and forth between Mikkel and Peter as both men do the talking to bring the situation to a resolution. Peter’s objective, though, is mostly to save the company as much money and embarrassement as possible, so his negotiation is a cool, almost clinical, debate. The CEO shows little concern for his men in the first stages of the process, as he refers to them more as assets than as human beings. A Hijacking uses the kidnapping to paint a tale of corporate greed in which people are chalked up in an economical tally of risk and rewards. Peter’s first offer, for example, is a paltry $250 000 to match the demand of $15 000 000 by the hijackers. He’s essentially playing with five million dollars of free company money, though, as A Hijacking introduces Peter as he squeezes four and a half million dollars out of a trio of Japanese business men in a game of boardroom hardball. The negotiation is a game of Let’s Make a Deal for Peter, not a case of loyalty or duty. His ego and reputation seem to be a greater stake than the men who form the base of his operation. A Hijacking is an unconventional rescue tale that lets the audience watch a corporate suit play the hero, for Peter’s psyche slowly crumbles as the negotiations draw out. The strain of the deal becomes visible as the composed man begins to crack. Peter realizes the repulsiveness in treating his own employees as numbers and becomes a surprisingly likable anti-hero when the talks draw into the eleventh hour. Lindholm constructs a drama that is consistently compelling even though it entails little more than shot/reverse shots of telephone conversations between Peter and Mikkel/Omar. Sparse handheld camerawork and minimal music give the film a sense of immediacy as Lindholm eschews the more cinematic content with the pirates and instead restricts the drama to the men of the negotiation. Harsh lighting grants a sense of exhaustion to the claustrophobic setting of both the boat and the boardroom. It’s a bold, bare-bones affair—rough and tumble like a Paul Greengrass film gone Dogme 35. If A Hijacking were an English-language Paul Greengrass flick it might fill multiplexes across North America. Coincidentally enough, Greengrass is at the helm of this year’s other pirate-jacking movie Captain Phillips, which stars Tom Hanks and opens this fall. Moviegoers will want to see A Hijacking first, though, to experience the kind of white-knuckle tension that comes by focussing on the psychology of the situation. When the film comes to its jarring finale—one can almost pinpoint the moment in the negotiation realizes that the situation isn’t going to end well—A Hijacking lets the audience leave unnerved, possibly shaken, even though it ends with near-conventional closure. A Hijacking has an unsettling ending because the story for ends both ends neatly and messily for Peter at the same time. A Hijacking opens Friday, August 16 at The Mayfair in Ottawa and at TIFF Bell Lightbox in Toronto.